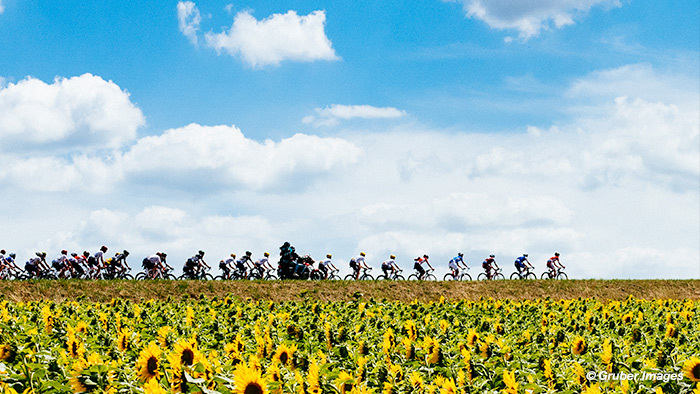 Stage 4 of the Tour de France was a very stereotypical sprint stage until the last kilometre, at this point the race was turned on its head with a chaotic sprint that ended up in a disqualification for multiple TDF stage winner Peter Sagan (Bora-Hansgrohe). The race had the day-long breakaway from Belgium Guillaume Van Keirsbulck (Wanty- Groupe Gobert) who spent nearly 190 km in the lead solo after attacking from the drop of the flag and then being caught with under 20km to go. This was a long day out front for the Belgium rider. The last 5 km of the race is where the party starts for the final, which featured a 1 km drag with about 5 km to go and then a fast approach into Vittel with a number of twists and turns in the last 3 km. A crash close to the front with 1.2 km to go caused a split, leaving just 20 riders to contest the finish, this was again narrowed down by another crash involving Mark Cavendish (Dimension Data) and Sagan in the closing 300 m bringing down a number of other riders. The race was won clearly by Frenchman Arnaud Démare of FDJ after this chaotic finish. Learn more about TrainingPeaks metrics here. The start of the stage offered a welcome change after the hard roads and aggressive racing of stage 3. This is reflected in Alexander’s power and heart rate in the first two hours of racing. In the first hour he averaged 118w, 1.56 w/kg with a very low HR of 87 bpm average. The second hour was a small gradual raise in effort but again still in the low power zones, 189w average, 2.5 w/kg with an average HR of 103 bpm. We can see that he had lots of punch left for the end of the race after keeping the power and HR low in the first part of the race. His effort was raised on the Col des Trois Fontaines, a 1.9-kilometre-long climb at 7.4 percent grade (category 4). With the team around him, Kristoff rode up this climb at 399 w, 5.27w/kg for 4:30. This effort only saw his HR raise to an average of 145 bpm, still well within his comfort zone. The action for Alexander started in the last 20km as they approached the last section of the race. The 1.7 km drag, which started with 5 km to go was to be a point that everyone needed to be at the front if they were to be in contention for the win. They had a fast downhill into the town of Vittel before a twisting last 2 km. It was plain to see the teams fanned out across the road as they hit the 15 km to go mark, at this point Kristoff was well positioned and cruising between 260w and 280w as he sat on the wheels of his teammates. There was a real concerted effort for Katusha-Alpecin to be right at the front as they hit this drag with 5km to go, with Tony Martin doing the lion share of work and Kristoff sitting five riders back protected in the wheels. At the bottom of this hill he hit the first 300m hard at 830 w average, 11 w/kg maxing out at 1130w, 15 w/kg on this 20 second effort to gain position right at the front. He then settled down to a one minute effort of 327w, 4.32 w/kg in the middle section of the hill before a final push over the top as they did the last 400 m in 32 second at 557 w average, 7.36 w/kg and a max at 900w just as they crested the top. This drag was a total effort of 2:02 at 489 w average, 6.5 w/kg. The fast descent into the town saw the bunch hit a max speed of 76.4kph (averaging 62.1kph). On this downhill section Kristoff still had to push out 324 w average to keep to the head of the bunch as the peloton passed the 2 km to go banner. The crash with just under 2 km to go meant that the group going for the sprint was whittled down to only 15 or 20 riders, with Kristoff sitting on the Lotto-Soudal lead out and on the perfect wheel of André Greipel (GER). In the section from 1.3 km to go until 250 m to go, Alexander averaged 553w, 7.31 w/kg and hit a max of 1105w as he jumped out of the bends to hold position. This effort of 1:15 was before he launched his sprint with 250 m to go. His sprint was started with around 250m to go as he came off Greipel’s wheel, at this point he was in the lead before being passed by the steaming Arnaud Démare (FRA) in the last 150m. This effort of 15 seconds in the last 250m saw Kristoff average 962w, 12.7 w/kg hitting a max of 1300w, 17.22 w/kg with an average speed of 60.3 kph and a max of 62.6 kph. This effort was enough to cross the line in third place, but with the disqualification of Peter Sagan he moved up to second place in the official results. A fantastic effort from the Norwegian to be on the podium in a TDF sprint stage. In contrast to that of Kristoff who was the protected rider for the stage in his team, Howson was part of the Orica-Scott riders with the job to keep the team leaders and GC contenders in safe hands and out of harm’s way. On the Cat 4 Col des Trois Fontaines he rode the 1.9km in 4:30 at 348 w, 5.2 w/kg, again a pace that was well within his comfort zones for this duration. In the final 20km we can see the pace being raised in the bunch with Damien averaging 50 kph from 20km to go until 5km to go. During this time, he averaged 238w, 3.56 w/kg and Normalized Power of 259w, 3.87 w/kg as he was still in contact with the main bunch. As the peloton and the sprinters team hit the drag full gas with 5 km to go it was at this point which Howson sat up and rode the last 5 km easy to keep his powder dry for the critical coming days. Chaotic sprint from a smaller group, Kristoff opens it and seems able to take it home before Demaré and the later DQ’d Sagan beat him to the line! The mostly standard sprinters stage may have been overshadowed by the disqualification of Peter Sagan but we did see the return of Alexander Kristoff to the front in bunch sprints. His team was clearly one of the most disciplined and well drilled on stage 4 and we can expect him to be on the head of affairs again on Stage 6 and 7. Howson’s relatively “easy” day will be turned on its head in Stage 5 when he will pay a big part in keeping the Orica-Scott GC contenders to the front on this first mountain top finish of the Tour de France. Get more Tour Stage analysis, course predictions and training takeaways from this year’s TDF here.